Drunk people on trains is nothing new, although I have to say that I avoid Virgin trains like the plague since finding myself coming out of Manchester on a three hour journey packed with intensely drunk football fans. It was lairy and scary without a guard in sight should things get a little ugly. 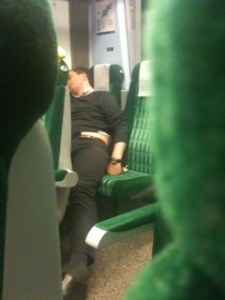 Recently, I have found myself consumed by the irresistible urge to sneak photographs of drunk people on trains. 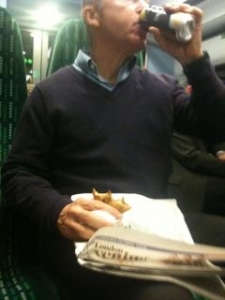 I also like to take pictures of people eating things on trains, especially when they try to do it serruptitiously. The man above was on the rather gentler London Midland line. Clearly a little the worse for wear, he lost consciousness somewhere around Watford, snored loudly for a while, then entered a violent dream state, like a dog chasing rabbits while lying on the carpet. Slumped in his coma, he was talking to himself too, (or rather, he was trying to answer the automatic voice that came over the tannoy at each station telling everyone to Mind The Gap). The train terminated at Northampton, and as everyone else got off, he just lay there twitching a bit with his mouth hanging open. 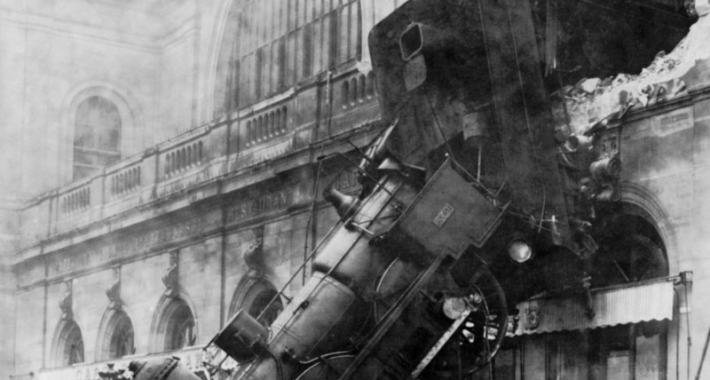 It was the last train of the night, so if Northampton wasn’t his intended station, he was scuppered. I wouldn’t like to have been him when the hangover kicked in. I don’t know how anyone can have the gall to get on a train with a bagful of stinking fast food. A sandwich is one thing, but the ghastly waft of a pastie floating through the carriage can be a bit much. These men, who may or may not have been travelling together, had carried out a dawn raid on Burger King. The bald chap is having some trouble staying upright. In all fairness, this chap didn’t appear to be particularly intoxicated, but it did seem like a strange picnic given that it was four o’clock in the afternoon. He didn’t do the hide-it-in-the-bag-while-eating-it thing either. Oh no. The pastie was wielded with Braveheart pride and he ate it like a man. Like all pasties, it stank the carriage out. Why would you choose to eat something like that (unless you’re seriously drunk)? Trust me. I know somebody who used to work in a pie factory. And it’s not good. 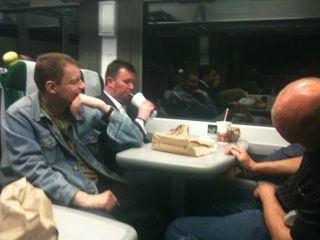 Incidentally, my lovely husband has admitted to eating pasties on trains too. Our daughters interrogated him until he broke down and confessed. Nothing like that on The Bullet train to S.B !! !